I received an interesting e-mail, asking various questions about the Park Hyatt Tokyo in the context of being a Hyatt Gold Passport Platinum member. Although the experience is maximized by reaching the Diamond level, there are still ways to enhance your stay at this hotel as a Platinum member, or even with no status at all. - is there a big difference between a PARK DELUXE and a PARK VIEW room? is it worth it? The Park Deluxe Room is a nice big room. It’s the first room I ever stayed at at the Park Hyatt Hotel, and it impressed me enough to maintain my Diamond status to this day. The Park View Room is like a miniature suite. It’s the same design as a Park Suite, with the bedroom and living room “smooshed” into one. While you won’t be disappointed with a Park Deluxe, I personally enjoy the Park View room much more. - is the hotel okay with people splitting their stay into two bookings to take advantage of better rates on different days? So long as you qualify for the rates, you can split your stay over as many rates as you like (the purpose of the Date Range Search tool on my site is to make searching for the optimal combination of rates a little bit easier. However, do not expect the Park Hyatt Tokyo to automatically extend the benefits of the best rate throughout the entire duration of your station. For example, if you book two nights in a Park View and two nights in a regular Park room, it is unlikely that they would let you stay in that Park View for all four nights; they may will stick to the terms of each rate to the letter. - should I just book a PARK DELUXE room because I am likely to get an upgrade to a PARK VIEW anyway (subject to avails). If staying in a Park View room is crucial to your stay, then you should book the Park View room. But, as you say, you have a fair chance of getting the upgrade and, as I said, the Park Deluxe is quite nice in its own right, so I would go with booking the Park Deluxe. - is there any way of getting around their late check in times on weekends apart from purchasing a day rate room? - are there any perks we should be aware of/travel tips/things to avoid. The two things I would keep in mind are the restaurants in the basement of the building and the Spa on the Park schedule. Park Hyatt Tokyo is part of a multi-purpose office building. Though not advertised as part of the hotel, there are several restaurants and convenience stores in the basement level that are of good quality and reasonably priced. The hotel restaurants are awesome, but you’re probably not going to want to eat breakfast, lunch, and dinner there for a week! Unfortunately, as a Platinum, you will not get free access to the spa facilities at Club on the Park. However, all of the activities at the pool and exercise area are still free to all paying guests. This includes pool exercises, fitness programs, and a good night sleep stretch. You can find details on the weekly schedule at http://www.parkhyatttokyo.com/Facility/Stay/cotp_exc_schedule_en.pdf. For a one week stay, this would offer considerable benefits that would offset both the $195 membership fee and the points lost through not booking direct via Hyatt. Regardless of how you stay, relax and enjoy yourself at one of the most luxurious, iconic hotels in the world! 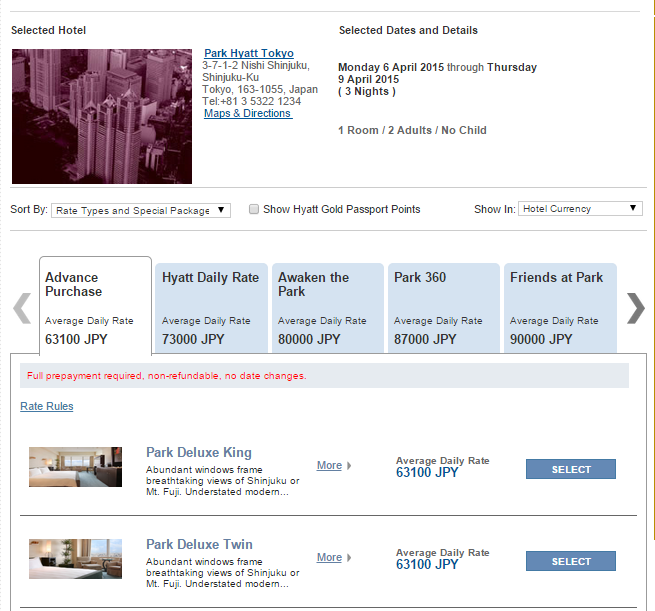 NOTE:The Park Hyatt Tokyo is no longer offering this plan. Enjoy an afternoon in our Park Deluxe Room with a leisurely brunch, access to Club On The Park spa, and cocktails at the bar for a perfect day. Day use of Park Deluxe Room from 10:00 a.m. to 5:00 p.m.
*This offer is not bookable on-line. For more information or to make a reservations, please call +81 3 5322 1234 or e-mail to reservation.phtoyko@hyatt.com. Not available through hyatt.com. From the description, it sounds like you get to feel like a Diamond member for seven hours. But can breakfast be eaten before 10:00? Can the spa and fitness facilities be accessed before check-in or after check-out? Which bar do you receive cocktails at, or do you get a choice? Do the Twilight Service appetizers come with the cocktails? And, most importantly, what does this cost? Based on the answers to this, it might be feasible to combine the value of a Hyatt Regency Tokyo stay with a splurge of luxury just a stroll through the park away at the Park Hyatt. But, as the description states, this cannot be booked online, and details that are online are sparse. 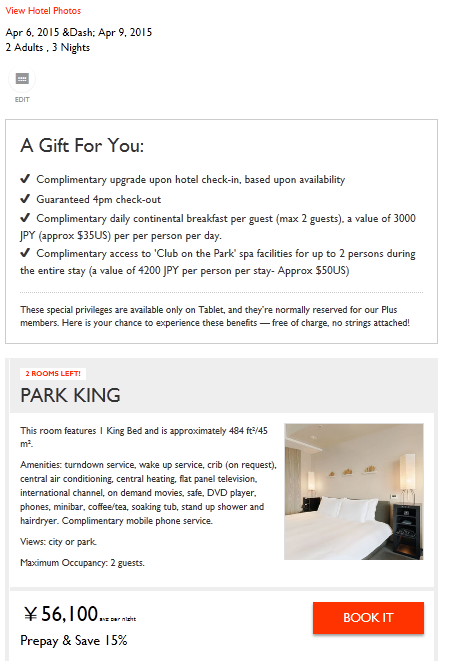 So I contacted the Park Hyatt Tokyo reservations department directly for further details. And here they are! Check in is at 10:00am. Check out is at 5:00pm. The Club on the Park can only be used between these times. For breakfast, you must stop by front desk beforehand so the breakfast will be registered to the room. Diamond Suite Upgrade cannot be applied to upgrade from Park Deluxe Room to Park Suite. Evening cocktails are for one drink per person in the Peak Bar, and do not include Twilight Service. Not eligible for stay credit in Hyatt Gold Passport. And finally, the one factor that determines whether or not this could a good deal: the price. I wasn’t going to ask about every rate for the rest of the year, so I choose a random weekday in mid-September, a time that I figured would offer a fairly reasonable rate. The verdict? A rate of 37,000 yen, or a total of 45,155 yen with taxes and fees (same for one or two adults) . This is not very far removed from the fare for a full night’s stay! What a shame. While this rate is probably geared towards wealthy Japanese housewives, if they would price this around 20,000 yen (maybe a bit more if they weren’t quite so stingy with the use of the Club), I bet that they could make a lot of extra money on rooms that would otherwise go empty, and give many more people a taste of what makes the Park Hyatt Tokyo so special. I give this rate a grade of 8 for creativity and a 3 for execution. Not worth pursuing further.